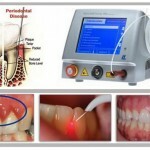 In our days, dental laser is unavoidable in the medical world. It allows to perform all acts of dentistry, for the treatment of decays to the most complex surgery. The laser technology is changing the way to practice dentistry in the interest of patients since it offers comfort during treatment and improves the effectiveness of medical acts. It offers a real comfort because it eliminates scalpels, burs and the handpiece noise, the usual discomfort of conventional treatments. Thanks to the laser, the need for sutures and anesthetics is greatly reduced, the healing is improved and finally, the use of dental laser also prevents bleeding, edema and pain. The laser treatments offers high precision and quality and its antibacterial effect ensures a complete sterility. When and where can we use the laser? -in implantology&periodontal surgery for decontamination of periodontal pockets and / or peri-implantitis, root planning, surgical incisions and second time in implantology, cleaning and disinfection of the pockets, sulcular debridement, removal of granulation tissue. -in microsurgery and soft tissue surgery to manage the floating peaks, management of gummy smiles excision of fibroids and all benign tumors, before prosthodontic treatments (crown lengthening) or frenotomies.